Please subscribe to our newsletter in order to be informed of its release. Royaumont Abbey was built by Saint Louis between 1228 and 1235 under the oversight of his mother, Blanche de Castille. The abbey’s isolated location, simple layout and unadorned buildings bespeak its origins as a Cistercian monastery. Remaining closely associated with the monarchy until the French Revolution (Cardinal Mazarin became its abbot in 1645 and the abbey was given to the House of Lorraine between 1651 and 1728), Royaumont was host to intellectuals and artists from its inception. Vincent de Beauvais, encyclopaedist and author of the Speculum Majus, was appointed reader at Royaumont in 1246 and Louis XIII held one of his ballets, La Merlaison, there in 1635. In 1791, the abbey was sold as “national property” but saved from destruction by its water system. It was transformed into a cotton mill, one of the largest industrial sites in the Seine-et-Oise region. Meanwhile, it became a magnet for society and the arts, with the Théâtre de Royaumont attracting the Parisian upper crust between 1834 and 1840. Converted to a noviciate in 1869, the abbey was extensively restored. The Goüin family then acquired it in 1905. During the First World War, the family made the site available to the Scottish Women’s Hospital, which cared for more than 10,000 wounded soldiers there between 1915 and 1919. The Abbey was listed as a historic landmark in 1927, the park in 1948. 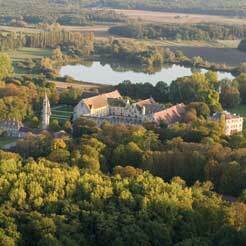 It is today the best-preserved Cistercian abbey in the Île-de-France region. 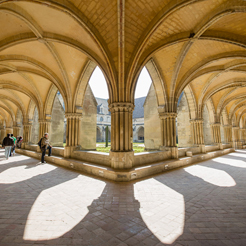 The primary purpose of the Fondation Royaumont, as the owner of the monastery buildings since 1964, is to conserve and enhance this outstanding heritage site. The foundation was established to revitalise and develop the historic monument by giving it a cultural purpose as a permanent gathering place for artists. The foundation therefore systematically includes in its restoration projects the functional developments needed to support its arts-related activities. A total of € 27 million was invested between 1977 and 2010, 53% of that amount since 2000. The purchase in 2007 of the François-Lang Library, the last major music collection remaining in private hands in France, reflects the foundation’s goal of enhancing the monument by making it the core of its support for the arts. In the 2011-2013 period, € 2.7 million have been earmarked to expand the work spaces and public areas. The contemporary history of Royaumont starts in 1936 when Henry and Isabel Goüin decided to hold public concerts there. The following year, Henry Goüin pioneered the concept of using a monument no longer serving its original purpose as a permanent cultural gathering place, creating a residence for intellectuals and artists at Royaumont. 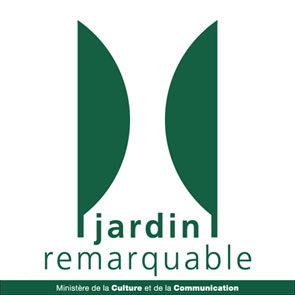 This served as inspiration for the founding in 1972 of the Association des Centres Culturels de Rencontre, which was expanded in 1992 to cover Europe as a whole. 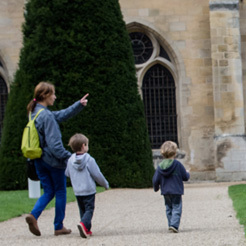 Royaumont is now one of the leading members of the resulting European Network of Cultural Centres – Historic Monuments. André Malraux wrote that “Royaumont is the first example of these great private foundations, which we hope will be developed in France, for the benefit of culture and our country’s prestige.” The Fondation Royaumont (Fondation Goüin-Lang pour le Progrès des Sciences de l’Homme), to which Henry and Isabel Goüin bequeathed their abbey, was awarded public interest status on 18 January 1964. - It finances its activities through funding provided by its public partners and private patrons (both corporate and individual) and by making optimum use of its own resources. The foundation, which pioneered multi- party agreements in the cultural sphere, has just signed its fifth master plan (which sets out its objectives up to 2013) with the French government, the Île-de-France region and the Val d’Oise department. In 1947, the Centre Culturel International de Royaumont, followed in 1953 by the Cercle Culturel de Royaumont, firmly planted music, literature and philosophy at the heart of the abbey, a “meeting place where attention is focused entirely on the mind and the intellect,” as Henry Goüin put it. In 1971, the foundation encouraged Europe’s first attempt at cross-disciplinary cooperation between biology and the anthropology, establishing the Centre Royaumont pour une Science de l’Homme, chaired by Jacques Monod. He left the foundation in 1973. A new project, headed by Francis Maréchal, was launched in 1978. It concentrated, from the start, on the interpretation of the music of the Middle Ages. René Clemencic’s students included Gérard Lesne and Marcel Pérès. In 1980, the foundation worked with William Christie and René Jacobs to organise France’s first master class in baroque singing. 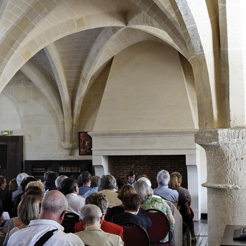 The Fondation Royaumont took part in the renaissance that gave rise to a new generation of French singers, welcoming renowned teachers and organising many repertoire study sessions. It was at Royaumont that Natalie Dessay gave her first recital, with Ruben Lifschitz, in 1991, and that Philippe Jaroussky held his first public concert in 1999. The Voix nouvelles programme was set up in 1983 to bring together composers and interpreters. The composition class organised in 1990 drew young composers from around the world, including Olga Neuwirth, Bruno Mantovani, Brice Pauset and Jérôme Combier. Between 1983 and 2000, the Centre de traduction de la poésie contemporaine devised by Bernard Noël and developed by Claude Esteban, Emmanuel Hocquard and Rémy Hourcade held 52 translation seminars and published more than 100 books, working from 1995 onwards with the Créaphis publishing house. The foundation further expanded its activities to include ethnological research programmes developed between 1980 and 1990. Contemporary dance arrived at Royaumont in 1995: Susan Buirge designed an innovative project focused on choreographic research and composition. Myriam Gourfink succeeded her in 2008, and Hervé Robbe in 2013. An experimental project bringing together artists from different disciplines, Le Grand atelier, was initiated in 2002. The Unité scénique programme was established in 2005 to train young professionals in stagecraft and lyrical productions held “outside the walls”, following on from earlier projects such as the Bourgeois Gentilhomme production prepared at the abbey by Vincent Dumestre and Benjamin Lazar. A programme dedicated to keyboards (harpsichord, pianoforte, piano, organ…) was set up in 2008 following the restoration of the Cavaillé-Coll organ and its installation in the monks’ refectory. The François-Lang Music Library was opened to the public in 2009. The goal is to foster the emergence and recognition of a new generation of artists through training sessions, experimental workshops and research and production residencies. 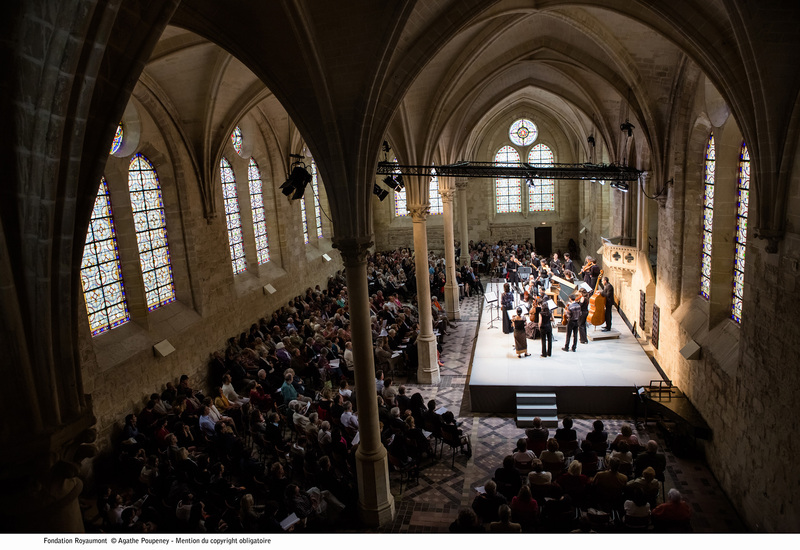 Royaumont also supports ensembles set up as part of two to four-year residencies. In 2016 these were: Ensemble Pygmalion, direction Raphaël Pichon, Ensemble Le Caravansérail, direction Bertrand Cuiller, Graindelavoix, direction Björn Schmelzer. The foundation nurtures encounters between creative artists, researchers and practitioners as well as multi-disciplinary experiments. To this end, it plans to bring together the Henry and Isabel Goüin Library, with holdings of more than 18,000 volumes, and the François-Lang Music Library, with a valuable collection that is being constantly expanded. This great library set to open in 2013 will be a venue for public debate involving the Humanities. Royaumont also strives to showcase forgotten or neglected works, to revisit the interpretation of the repertoire and to commission musical, choreographic and multi-disciplinary works. In doing so, the foundation encourages interaction between the study of the works of the past and the invention of new works, between the oral heritage, improvised music and art music and between a monumental heritage and artistic creation. Over the course of the year, the foundation organises about 40 public Fenêtres sur cour[s] sessions and at the end of the summer it holds a series of 35 to 40 concerts and performances in conjunction with exhibits, symposia and publications. All these events are generated by the projects designed by the arts programmes together with the artists in residence. The foundation’s productions - especially the operas staged by the Unité scénique programme and the programmes of the ensembles in residence - are performed throughout France. The foundation works with cultural partners to promote the dissemination of artists and projects at such venues as L’apostrophe, scène nationale de Cergy-Pontoise et du Val d’Oise, the Théâtre de Saint-Quentin-en-Yvelines, the Pontoise Baroque Music Festival, ARCADI, the Opéra Comique, Il Centro Studi Europeo di Musica Medievale Adolfo Broegg (Spello), the Aix-en-Provence Festival, the Théâtre de l’Athénée, the Maison de la Culture in Amiens, the Lille Opera, IMEC, and Noirlac Abbey. 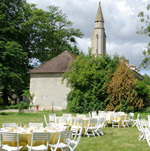 The accommodation and catering department annually welcomes more than 230 residential seminars, symposia and events organised by businesses, scientific and academic institutions and international organisations, which have included METRO-House of Training, Les Entretiens de Royaumont, EADS, AG2R, Lyreco, Nestlé, the Institute for Jewish Policy Research, the University of British Columbia, Lennart Wallenstam Byggnads, Inserm, CNRS, ESSEC, the French Ministry of Foreign Affairs, and the Comité d’Expansion Economique du Val d’Oise. The foundation’s development is supported by sponsors, reflecting its close ties to the business community. Nearly 40 companies collectively or individually sup- port Royaumont projects: the Comité Henry Goüin, a club of companies. Individual philanthropy on the part of the 630 members of the Friends of Royaumont Association and many individual donors also makes an invaluable contribution to this development. Ticket office closed between 12:45 to 1:45 pm Monday to Friday.